Moving into a newly renovated house? Make sure you and your family members are safe and book the a professional after builders cleaning Kingston upon Thames KT service offered by Better Cleaning Company. Our vetted and trained after builders cleaners can clean any commercial or domestic property in the region from all the builders waste, dust, debris and paint or plaster safely and at an very affordable price. Get a free price estimate by calling 020 3746 3201 or post us an online request here. Our customer care employees is at your service for inquiries. The exciting post renovation cleaning in town! Our post renovation cleaning company in Kingston upon Thames KT has high experience in the field and we are completely equipped with the latest devices for faster sanitising and authorized instruments for safe stain removal and disinfection. Through the years we have learned the fundamentals in all international cleaning standards and acquired the latest after builders cleaning methods. We have been offering high-quality, trustworthy after builders cleaning in Kingston upon Thames KT for more than 10 years. Better Cleaning Company is now a widely recognized and very respected expert cleaning services provider in the whole region. We select all our experts, check them and coach them extensively. We work with the newest professional cleaning solutions machines and tools. Our mission is to help make your residence liveable efficiently and quickly after renovations or reconstructions have been done. To make sure that your property is back to normal after latest repainting has been performed, book our top-class post builders cleaning service today! Our very efficient after builders cleaning service includes cleaning and polishing of fittings and fixture removal of dust, labels, tape, coverings, paint splatter, adhesive and all areas cleaned after the contractors have completed their renovation or renovation work in your residence. We ensure that all techniques for health and safety are implemented, and we will leave your commercial or private property sanitised, safe and looking great in a few hours. Our experienced and vetted cleaners use innovative cleaning tools, and absolutely eco-friendly and safe Prochem certified cleaning solutions. Regards to the 24/7 client care service provided by our after builders cleaning company Kingston upon Thames KT, all users in the region can immediately and quickly take advantage of our simple reservations system. Call up at 020 3746 3201 or give us an online request here. We have fair and fixed charges, and . Loyal customers together with estate companies and owners get charges. Those who book more than 1 of our services at the same time get discounts of up to 15 persent. We are available for same day service as well. 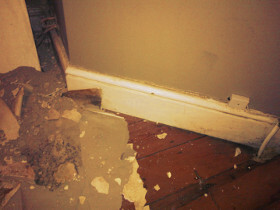 Our only condition is that the builders must have finished their work and left the property. So, ensure your property is once again and book our post renovation cleaning now!